Transformers: Trading Card Game Review — GamingWithSwag.com - Dads By Day, Gamers By Night. Introduction/Overview: Admission time. Even though I am the proper age, I did not grow up as a Transformers fan. My grandmother got me an Optimus Prime figure for Christmas one year, and I had no idea what to do with it. I think it got sold at a garage sale a couple years later. I was more of a Looney Tunes kid. When the Transformers movie came out in 2007, I went and mostly enjoyed the movie...enough to buy the DVD at least. I’d prefer not to admit any of the other Michael Bay movies exist. Luckily, by the looks of the cards in this game, it seems like Wizards of the Coast has chosen to ignore the movies as well. Gameplay: On a regular turn (there are a couple changes for the first turn) you draw a card, and then do up to three actions. You may only do each of these actions once each turn. You can flip one of your robot cards to their other side (sometimes triggering an innate ability). You can attach an upgrade card to one of your robots, and/or you can play an action card from your hand. That’s really it...oh wait, attacking. After you do those three things then you may attack. You choose one of your untapped robots to attack with, they then tap. You can attack any of your opponent’s robots that are already tapped (if they don’t have any, you can attack any of them). This is the one big tactical point to the game. Do you bring out your big gun early in the turn, and let it get wailed on by all of your opponent’s bots? Or do you hold it back until their forces are depleted? Then each player flips the top 2 cards of their decks over. These cards have symbols that may add to the power or toughness of their robot. The totals are compared, and damage is assigned. And that’s pretty much the game. Play until one player doesn’t have any more robots in play! Rulebook: This is hard to answer because there really isn’t much of a rulebook. In fact, if you only buy the first Autobots Starter Set, you’ll only get a tiny 2-page “Beginner Game” pamphlet, and the game you play is only partially representative of the full game. I had to go online and print out the entire rule book. This “book” was 3 pages long. Single-sided. It is not a difficult game at any level to understand. It does bother me that they couldn’t be bothered to put the full rules in with the first product they released. The full rules are in the Metroplex set, but two players can’t use that set by itself to play the game. It’s kind of a frustrating mess. Theme: It’s giant robots beating each other up. It’s the most awesome theme ever. Set-Up/Takedown: Shuffle your battle decks, and put your bots on the table. Nothing else to it. Hooray card games! Some truly wonderful art. The pic doesn't do the special foil bits justice. Components: This is the most ridiculous part of the game. There are three sizes of cards (so far). The regular Magic/Pokemon-sized cards that make up your battle deck. Those are fine, although I have had quite a few corners get dinged up a bit easier than my other games. The regular Transformer cards are oversized, double-sided, and look fantastic. I especially like the subtle UV-highlights on some of the cards. The art looks sharp. They are roughly the size of Magic: the Gathering’s Commander cards. Then there are the Titans like Metroplex. Those cards are EVEN bigger! There is no storage or sleeving solution I have seen yet for these. They give the game a great “toy” factor and table presence, but for people that care about stuff like condition and transportability, they are a nightmare. The card that Wizards put in the box for damage counters is insulting. The tokens don’t rip cleanly, and are very thin and fly away if you think about breathing on them. Throw the card away, and use anything else at all for damage counters. Solo-Play: No, although it probably wouldn’t be terribly hard to play two decks against each other by yourself if the need arose. Final Thoughts: I have so many thoughts swirling around in my mind about this game. I absolutely love the way this game looks on the table. I think the card-flipping mechanic to get from bot to “alt” mode is ingenious. I do think there is a little bit of depth to the game, especially when it comes to choosing in what order you attack. It’s not a brain melting game, but you can’t go in blindly flailing either. The game is very beginner-friendly. Even as far as building your own battle deck. Several of the cards are keyed to certain robot types, and a few are only useful if you have a specific bot on your team. I believe there are under 100 cards in the full battle card set, so you won’t be overwhelmed with choices. 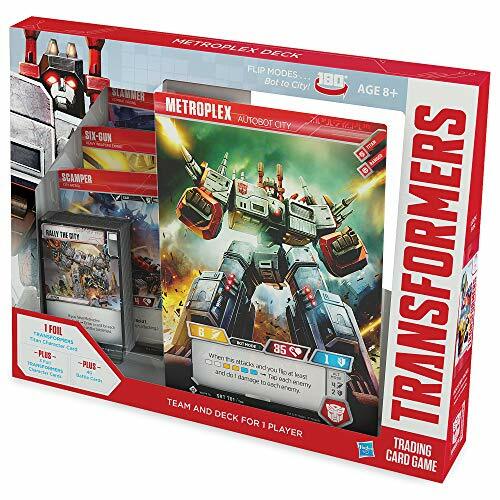 My biggest negative point is that this game has now been out several months now, and we don’t have a Decepticon team set. You can get them in the random booster packs, but I’ve not been able to get enough to even field a team. So unless you buy enough to get the right cards, you have to play this game as Autobots fighting Autobots! I’m not pleased at all with this. I hope this situation is fixed soon. I have my doubts because Wizards is rather well-known for killing their games off really fast if they don’t see it becoming a huge smash hit. All that being said, I kind of have a soft spot for this game. I like it. It’s dumb fun. It’s clearly aimed at the Pokemon aged crowd, but it’s an even simpler game. This is just a toe-to-toe brawler, and it makes me smile. I hope the game has enough future to get a couple more sets at least.